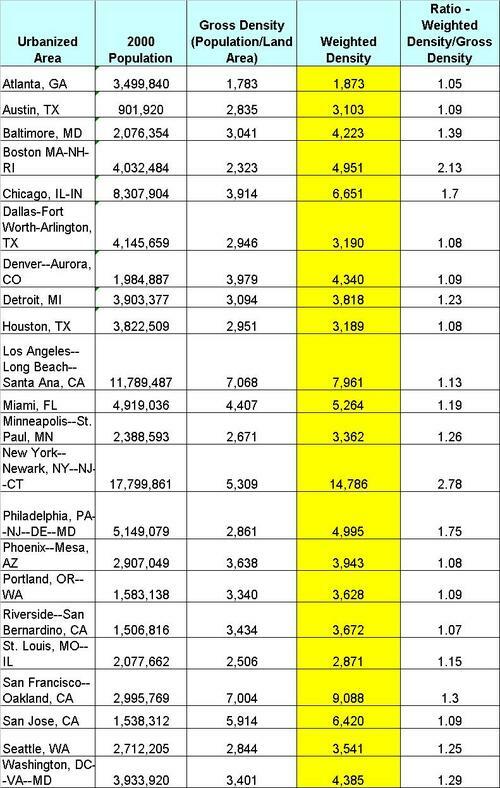 Every once in a while -- invariably in a debate over sprawl -- someone will toss out the "fact" that the Los Angeles metropolitan area is denser than the New York metropolitan area. It's true. At least, it's true if one uses the standard definition of density as gross population divided by gross land area. According to 2000 U.S. census data, the Los Angeles "urbanized area" has a density of 7,068 persons per square mile. The New York urbanized area has 5,309 persons per square mile. Ergo, Los Angeles is denser than New York. Los Angeles is hemmed in by its geography, so it can’t just keep spreading at ever lower densities out into the wilderness. As such, its density profile is like a plateau–not all that tall at anyone point, but with a respectable average height, because the long tails are excised. New York, by contrast, is like a mountain. It has an enormous peak containing most of the mass, but the flattening sides of the mountain continue on for miles. In other words, the fact that the last million or so people in the New York metro area occupy an incredibly large area while the last million or so Angelenos are in moderate density suburbs packed against the very edge of the basin, skews the relative density figures, making them pretty uninformative. A more meaningful metric is "weighted" density or "average perceived density." Carve the metropolitan area into distinct regions (census tracts, for example), compute the density of each, and then assign each a weight based on its percentage of the total population. This discounts large, sparsely populated census tracts, and gives extra weight to densely populated tracts. An extreme but simple example: Suppose Metropolis consists of a central core of 100,000 residents on 10 square miles, and a suburb of 10,000 on 100 square miles. Its standard density is 1,000 persons per square mile. But this is a meaningless number. Most of the residents of Metropolis live in a very dense environment. The roughly 90% who live in the core are packed in at 10,000 per square mile, while just 10% live at the rural density of 100 per square mile. By giving the core's density a weight of 90%, we get an adjusted density of 9,100 persons per square mile, a much better description of the density perceived by the average resident. I show the weighted densities for some U.S. cities below the jump. I used 2000 Census Bureau data for "urbanized areas." In Census-speak, an urbanized area consists of one or more "central places" -- essentially, incorporated cities at the core of a metropolitan area -- and any adjacent territory with a general population density of at least 1,000 per square mile. The Census Bureau gives the population and density for each central place in the urbanized area. It also gives the population and density of the area not within one of the central places. I assigned weights to the central places and the "non-central" place according to their respective percentages of the total urbanized area population. Surprise. New York is denser than LA. NYC's standard density is 5,309 per square mile. Its weighted density skyrockets to 14,786. LA's density, on the other hand, merely creeps up from 7,068 to 7,961. Boston is less dense than Austin under the standard metric, but 50% more dense using the weighted metric. Most of the northeastern cities -- Boston, Philadelphia, New York, D.C. -- are significantly denser using this measure. (Note that Austin, Houston and Dallas have almost exactly the same weighted density.) Western cities such as Los Angeles and Phoenix see only a slight increase, reflecting the fact that their population is more or less evenly distributed. Caveat: It would be better to use census tracts rather than central places. An otherwise dense central place could still contain low-density areas that would pull down its average. Using census tracts would largely solve this problem. When I find time to run the calculations with census tracts, I will post the results.